Born to the Irish nobility. Monk at the monastery of Hy. May have been an abbot. Travelling bishop throughout Ireland. Missionary with eleven companions through Gaul to Würzburg, Germany whose people he found to be pagan, and whom he resolved to convert. Pilgrim to Rome, Italy in 686 where he received papal authority for his mission; Pope Conon ordained him as a missionary bishop. Kilian then returned to Würzburg in 687 with Saint Colman and Saint Totnan. With them, he evangelized East Franconia and East Thuringia, areas in modern Bavaria, Germany, converted Duke Gozbert and a large part of Gozbert's subjects. After Duke Gozbert converted, Killian explained that the duke's marriage with Geilana, his brother's widow, was unlawful. He secured the duke's promise to leave her, which made an enemy of pagan Geilana. She plotted against the saint, and caused the murder of him, Colman and Totnan, and the burial of their corpses, sacred vessels, vestments, and holy writings at the crime scene. When the duke returned to her, Geilana denied knowing the location of the missionaries. The actual murderer went mad, confessed his crime, and died miserably. Geilana herself eventually died insane. Kilian's good work did not long survive him. 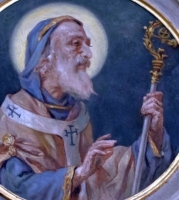 When Saint Boniface arrived in Thuringia, he found evidence of his predecessor's influence. The relics of the martyrs, after cures had brought fame to their burial place, were transferred to the Church of Our Lady in 743 by Saint Burchard, first Bishop of Würzburg. After Burchard obtained Pope Zachary's permission for their public veneration, they were solemnly transferred, probably on 8 July 752, to the newly finished Cathedral of the Saviour. Later they were buried in Saint Kilian's vault in the new cathedral erected on the spot where tradition says they were martyred. His skull is still preserved, is be-jewelled, and is processed on his feast day. Killian's copy of the New Testament was preserved in Würzburg Cathedral until 1803, and since then has been in the university library. Born to the Italian nobility, he received a good education in music, literature and the sciences. As a young man he felt a call to religious life, gave away all he had to the poor, and left home to live as a hermit in the area of Campania, Italy. He and a another hermit, named Giovanni, developed such a reputation for wisdom and holiness that they attraced would-be students, and the local feudal lords built them a hermitage and a church dedicated to the Blessed Virgin Mary. The two hermits wanted the property entrusted to a religious order, so Pope Gregory XIII sent the Camaldolese Benedictines. With the place and the local people cared for by the monks, Giulio withdrew from the area to return to life as a prayerful hermit. With the permission of the monks, he lived near the abbey of Montevergine, but never joined the Order. He served the abbey for 24 years as organist and achieved such a reputation that people came from other cities to hear him during liturgies. Daughter of a tenth century Irish king. To avoid an arranged marriage with an invading pagan king, she, her brother Alban, and several female companions fled her home to settle in a cave on the island of Selje off the Norwegian coast. Some time later, Viking locals decided that the group was stealing cattle, and sent an armed band to attack them. When they arrived, they found the cave sealed by a landslide; none of the group of exiles were ever seen alive again. Years later, around 995, after reports of strange lights in the area, King Olaf Tryggvason had the cave opened; Sunniva's body was found incorrupt, and the king built a church there in her honour. Sunniva's story was retold and revised over the years, often combining elements of Saint Ursula's history. Sometimes she is a nun leading a group of pious sisters seeking solitude. According to post-Reformation sources, Sunniva had two sisters, Saint Borni and Saint Marita, and her brother was Saint Alban. There they all died in one of the periodic crackdowns against foreign missionaries. Born a prince, the son of King Edmund I and Saint Elgiva of Shaftesbury. King of the Mercians and Northumbrians in 957. 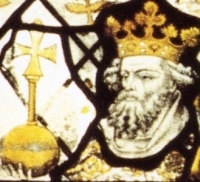 King of the West Saxons on 1 October 959, which effectively made him king of all England. Efficient and unusually tolerant of local customs; while he spent much time in military actions, his reign was a peaceful period for civilians. Supported his friend Saint Dunstan, Archbishop of Canterbury, Archbishop Oswald of York, and Bishop Aethelwold of Winchester in founding abbeys, encouraged the Benedictine movement, and enacted penalties for nonpayment of tithes and Peter's pence. Father of Saint Edward the Martyr. Prominent Cistercian monk. Friend of Saint Bernard of Clairvaux. Abbot of the monastery of Tre Fontaine. Elected pope unanimously on day of his predecessor's funeral; the cardinals wanted a quick election to prevent the interference of secular authorities. Promoted the disastrous Second Crusade. In 1146, the agitation of Arnold of Brescia and the republicans drove the pope from Rome. While in exile from 1146 to 1149 and again from 1150 to 1152, Eugene worked to reform clerical discipline. Travelled from Turkey to Jerusalem as a boy during the ministry of Jesus. Back in Antioch, he and his entire family converted. Hermit in a cave in Pontus. Consecrated as a missionary bishop by the Saint Peter the Apostle, and sent to Taormina, Sicily. Miraculously saved the city from destruction by the pagan commander Aquilinus. Martyred by other pagans who opposed Christianity. 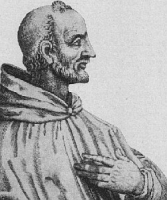 Benedictine monk, and prior of Saint Bertin monastery. Alfred of England was impressed with the man's holiness, and when he ascended the throne, Alfred asked Grimbald to come to England to share his knowledge and holiness. Grimbald arrived in England around 885, and impressed many with his knowledge of Scripture, his skill in music, and his holiness. Grimbald helped found the University of Oxford, and served as its first professor of divinity. Declined the bishopric of Canterbury. He retired to Winchester, and with the king's encouragement, he began the foundation of Newminister, and was then installed as abbot. After two decades in England, Grimbald became ill. He took Communion, spent several days in contemplation, gathered the monks of the community to his room for one last time of fellowship, and died. Preached the First Crusade to recover the Holy Lands from invading Muslims. Went with the armies of Godfrey of Bouillon. Vicar General of the Patriarch of Jerusalem. Returned to Belgium in 1099. Founded the Neufmoustier monastery in Huy, Belgium were he served as prior for the rest of his life. 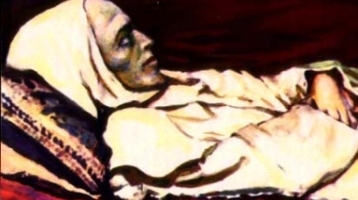 Known as a popular preacher and for living an extremely ascetic life; when his relics were moved in 1242 he was discovered to have worn a hair shirt under his habit. Pope for approximately one year. Almost nothing is known of his life before his ascension. Adrian opposed the Roman aristocratic faction led by the corrupt bishop Formosus, and arrested the more violent members of the group. He died en route to Worms, Germany where he was going to help settle the question of succession to Emperor Charles the Fat. Five Christians martyred together for their faith. We know nothing else about them but the names - Cecilia, Eperentius, Eraclius, Sostratus and Spirus. First century Jewish tent-maker. Married to Saint Aquila. Convert to Christianity. Entertained Saint Paul in Corinth and Ephesus. While they lived in Rome, Italy, their house was used as a church. Mentioned in Acts 18; Romans 16; 1 Corinthians 16; and 2 Timothy 4. Martyr. First century Jewish tent-maker. Married to Saint Priscilla. Convert to Christianity. Entertained Saint Paul in Corinth and Ephesus. While they lived in Rome, Italy their house was used as a church. Mentioned in Acts 18; Romans 16; 1 Corinthians 16; and 2 Timothy 4. Martyr. Born to the nobility. Count of Schauenburg, Germany. Conquered the Holstein region of modern Germany from invading pagan Danes in 1225. Crusader to Livonia in 1228. Founded monasteries in Hamburg and Kiel in Germany. Joined the Franciscans in Hamburg in 1239. Ordained in 1245. Layman catechist in the apostolic vicariate of Southeastern Zhili, China. Martyred in the Boxer Rebellion. Lifelong layman in the archdiocese of Nagasaki, Japan. Gave Blessed Francisco Pacheco a home during his missionary work. For this he was imprisoned and left to die. Martyr. Evangelized Franconia and East Thuringia. Worked and martyred with Saint Kilian and Saint Totnan. Physician. Taught medicine. Treated the poor for free. Chosen bishop of Nevers, France, he became a priest in order to be consecrated. Evangelized Franconia and East Thuringia. Worked and martyred with Saint Kilian and Saint Colman. Soldier in the imperial Roman army. Martyred in the persecutions of Diocletian for having declared himself a Christian in open court. Bishop of Milan, Italy from 665 to 672. Worked to Christianize the invading Lombards. No details about her have survived. She is reported to have appeared in visions in Morwenstow, Cornwall, England where her relics are apparently buried under the church floor. Sixth or seventh century scribe and bishop of Mothil, Waterford, Ireland. May have been the nephew of Saint Patrick, and may have served as his secretary. A group of monks in a monstery founded by Saint Abraham of Ephesus. Martyred in the iconoclast persecutions of emperor Theophilus. Noted for his charity to the poor. The village Arnoldsweiler, Germany is named for him. Founded the convent of Munsterbilsen, Belgium and served as its first abbess. Bishop of Benevento, Italy. Forced into hiding during the persecutions of Diocletian. Spiritual student of Saint Martin of Tours. Evangelist.